This is a tale of two visits, one in the depths of winter, the other on a fine day in high summer twelve years later. I can tell you now that on neither occasion did I get inside this church, so if that is all you are interested in you may as well stop reading now. 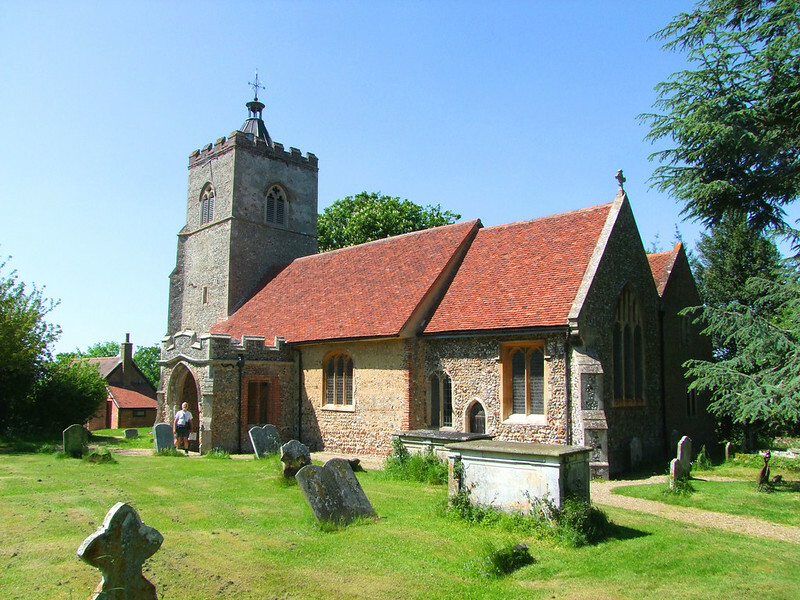 The occasion of my first visit to Little Cornard church was on Boxing Day 2000. It was one of those chilly, damp winter days when the temperature plummets towards zero, forgets to stop, and heads below. That evening, a group of us sat in the fierce, dark, convivial heat of the Ship and Star in Sudbury, escaping from the bosom of our families, and getting quietly mellow. This had become something of a tradition for us; and, it would seem, for other people too, for the place was heaving. My friend Stephen (all locals will know his house on Acton Square, the one with lifesize Star Wars characters standing in the windows) was holding court. Jacqueline discovered a group of old school friends, and ensconced herself in a round with them; I was pinned in a corner with Sarah, who daily commits the sheer act of lunacy of commuting from Sudbury to Martlesham, Catherine who works in a Seventies retro-clothes shop in Dublin (no, she doesn't commute) and Nancy, who actually comes from Little Cornard. I had bumped into Nancy and her mother earlier in the day, on the wild track that leads through a farmyard along the ridge to All Saints; but it had been so cold, so bitterly cruel, and we had all wrapped ourselves up beyond recognition; so it was only on reflection that we'd realised who each of us were. 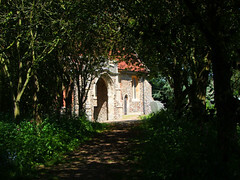 And now, my mind kept going back to that beautiful, secret place; for the graveyard of All Saints is quite simply one of the loveliest places in all Suffolk. As Mr Adnam worked his magic, my thoughts drifted gently through the icy silence of the tree-wreathed graves, and the sweet little church itself. Anyone who knows Great Cornard, that vast 1960s estate on the south side of Sudbury, would not begin to think that its twin in name only could be so totally different. If anyone knows anything of Little Cornard, it is probably Martin Shaw's hymn tune of that name, the most common setting of Hills of the North Rejoice. So on Boxing Day morning, we abandoned our children with their grandparents, and set out to find it. You leave the centre of Sudbury on the Bures road, through the light industry and large Victorian houses, past mundane St Andrew and the pubs, the roofs of acre after acre of lowrise council estates below you. After a couple of miles, the houses thin out, fields appear, a pub that is very much a village one passes, and you are in Little Cornard. As you reach the real countryside, a sign directs you up a steep lane to the left, and your adventures begin. The narrow lane climbs steeply between high hedges, and you hope that you don't meet anything coming the other way. Soon, you reach the top of a ridge above the Stour; it is actually the last dying gasp of the Chilterns as they sink slowly into the east. The road winds between 18th century houses and 19th century farm cottages, doglegging alarmingly at one point, the blind turn not revealing until the last minute that the road was flooded on the other side. But we ploughed on, reaching a farm. A sign indicated that All Saints Church was across the farmyard, so we drove in. But the track on the other side was a swamp, so the very kind lady at the farm let us leave our car in the farmyard. 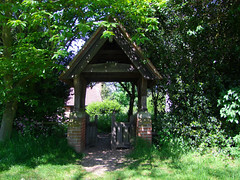 We walked along the track between wild hedgerows and wooden palings, and eventually found ourselves headed towards a handsome lychgate, the tower and 19th century lantern of All Saints peeping up above the wilderness of holly, ivy and yew that surrounded it. Stepping through, we found ourselves in the most delightful of graveyards, with scatterings and groupings of 19th century graves among the wild trees; only the modern graves to the east are organised in rows. To the east of the church stands a massive pine tree. 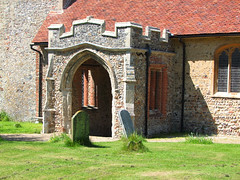 This is unusual in Suffolk, where open churchyards are more the rule these days, and it places the building in a setting at once dignified and mysterious, as if nature hadn't entirely given this place up to the material world. My one disappointment of the day followed, for the church was locked without a keyholder. Mortlock tells me that much survives of the 14th century, but that what appears to be a most curious north chancel chapel is, in fact, a 17th century vestry, built on two storeys. Looking through the window, I could see that the Victorians rather ingeniously knocked the floor out, and opened the whole thing out into the chancel. It is now an organ chamber, with the character of a north transept, as at Baylham. The 19th century windows can be seen through the clear glass of the north side, where I could also just make out a 15th Century roundel of an angel. 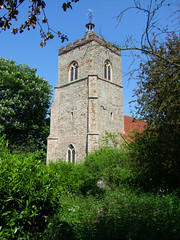 But the churchyard was worth the visit alone. Here, a strong sense of 19th century sentimentalism has survived, of that almost-Catholic piety nurtured by the Oxford Movement, and then transmuted into emotion by the sense of destiny of a National Church in possession. The First World War would overcome the silliness, and the end of Empire defeat it all utterly. But that was still in the future. Death has haunted this little parish. Mortlock reminds us that it was the first place in Suffolk to report the Black Death (being, as it is, on the Essex border) and at least 60 people died; 21 families with land lost all their adults. Here also, the Danes and the Saxons fought a brutal, bloody battle. 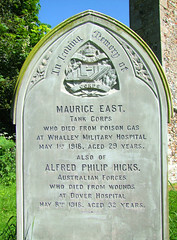 The Parish lost two soldiers in the First World War, and their joint gravestone is one of the most explicit I've seen, rather more moving than the sanitised official ones to the east of it. 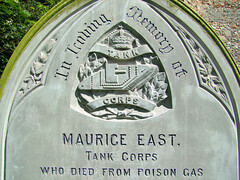 Another very striking feature of the churchyard was the large number of cast iron gravemarkers. Many of these are of a broadly similar design, and cast at the foundry of W. I. Green, at Sudbury. His nameplate is on the back of several, and a pair leaning face down display it prominently. 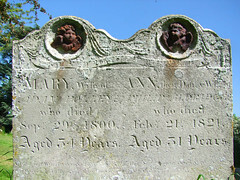 Others are rather more ornate, with a classical motif of a weeping woman by an urn, and pious sentiments. I could find no foundry name on these, but they probably came from the Melford foundry which specialised in elaborate memorials. 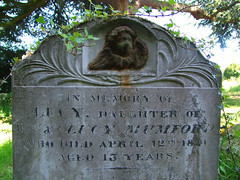 Most movingly, one of the cast iron markers, to a child who died at the age of 2 in 1906, still had fresh flowers before it. 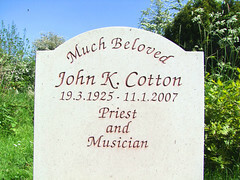 I found this again and again in the graveyard; this is a well-loved, well used place. On other entries I have been disparaging about the recreational grave-tending of the modern cult of the dead; family graves seem to have taken over from allotments as a place you make yourself busy, and churches that were once considered places of private prayer have been left behind long ago, their doors locked and untried. But here, there was still a sense of holy communion between the living and the dead. But why are there so many 19th century graves here? Can this parish really have been so big 150 years ago? White's Suffolk 1844 records George Mumford at Caustons Hall and George King at Peacock Hall. 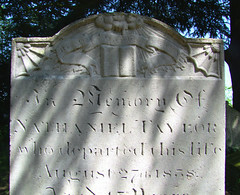 William Sandle, John Bell, Henry Segers and Ann Taylor were four other farmers. Edmund Tricker was a brickmaker, William Rayner a blacksmith. William Pochin was Rector, and that was about it as far as people important enough to be named go. But 396 people lived here, scattered across the parish, almost entirely working on the land, making it a small to medium sized parish for the time. The population is about half that today. If rural populations are declining, it is despite the efforts of the Knight family. 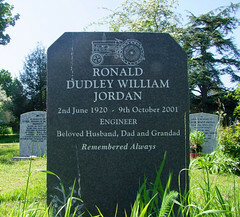 Their modern grave (mum died only in 1995) is to the east of the chancel, and the back of it records no less than SIXTEEN children born to the couple between 1934 and 1957. And yet, what will remain with me is the loneliness, the silence of that beautiful spot. We walked back to the farmyard, wrapped up against the sub-zero wind, wishing the similarly wrapped up Nancy and her Mum a good morning along the path. We drove back down to civilisation, again being thankful for not meeting another car on the narrow lane. Modern Sudbury engulfed us with its noise, but we carried with us the serenity of lonely Little Cornard. And so it was, that evening, as I sat happily making a fool of myself in the Ship and Star over pretty young things, that I drifted away from the heat and the noise occasionally, my mind picking its way between the cast iron graves. I would go back there. Well, the years passed. The Ship and Star closed and was converted into a house. I lost contact with Catherine and Nancy. And so it wasn't until the early summer of 2012 that I retraced my footsteps, in the company of David Striker my amazing American friend who has visited just about every church in Norfolk, Suffolk and Cambridgeshire despite the slight handicap of living in Colorado City. It was a gorgeous day. Twelve years had passed, and in any case the churchyard looked so different under its cloak of green and white that I remembered nothing. A jolly bearded chap was exploring the churchyard - you can just make him out in the photograph at the top - and it was a reminder to me that a number of footpaths meet here, this is a popular spot for ramblers. There was still no keyholder notice, but there was a list of the churchwardens which gave telephone numbers. I rang one of them. He wasn't terribly patient with me - he made it clear he considered it an imposition for me to call him. But he said if we were prepared to wait he'd be there in fifteen minutes. Well, fifteen minutes became twenty, and then twenty became thirty. As lovely as this place was, there was no way we could allow this amount of time on one church when David had travelled from the States for this trip. So, we left. We headed on down the narrow lanes and eventually reached the small town of Bures beside the River Stour. Here we stopped at a pub for a pint, sitting in the garden in the sunshine. After a while, my mobile phone rang. I looked down at it, recognising the number of the Little Cornard churchwarden. It was almost an hour now since I had spoken to him. Perhaps he was ringing me up to apologise for being so late. Maybe something awful had happened, maybe he'd fallen down or had an accident or been prevented in some other way from coming to the church. But remembering how irate he'd been when I rang him in the first place I thought that this was probably not the case, and so I didn't answer it.